Coated Glass Market size was over USD 14 billion in 2016 and industry expects consumption above 19.5 kilo tons by 2024. Modern infrastructure with better aesthetics in construction projects along with safety and security in vehicles has surged coated glass market size. Rapid urbanization rate owing to favourable government schemes in China, Singapore, India, South Korea, and Brazil with increase in automotive production base has fuelled product demand. Better safety and lightweight properties of the product in automotive sector has further surged industry growth. Technological advancement in transportation sector regarding safety and high fuel efficiency, has positively influenced the manufacturers to invest in R&D and expand & improve the product portfolio, thereby fuelling coated glass market growth. Over 3 million units of commercial vehicles were produced in China in 2016. Increased product usage in automotive windshields will stimulate coated glass industry size. These products help in reflecting unwanted IR and UV radiation, and offers safety, thermal shock resistance and durable properties, thus propelling product demand. Globally, over 70 million units of passenger cars were sold in 2016, in which Europe accounted for over 25% of the sales. Change in lifestyles of consumers along with rise in consumption of aesthetically appealing and luxury cars should further surge coated glass market demand. Growing product demand in energy efficient buildings along with rise in construction spending are driving coated glass industry. Increasing consumer safety concerns and strict environmental regulations regarding carbon emissions will stimulate industry growth. These products have the capability to cut down CO2 emissions and save up to 25% of the energy in the buildings, thus resulting into increased product demand. According to EU Commission, greater usage of these glasses in residential, commercial and industrial buildings in Europe could save approximately 15 to 80 million tons of CO2 annually by 2020. Silica, soda ash and natural gas are the key raw materials used in coated glass manufacturing process. High infrastructural and transportation cost along with supply demand gap in availability of raw materials will hinder coated glass market price trend. Increased usage of sustainable energy resources along with strict norms regarding environmental parameters should offer growth opportunities. Low Emissivity (Low-E) coated glass market size may register above average gains at over 5.5% at the end of forecast period owing to its application potential in construction and automotive sectors. It is widely used in residential and non-residential buildings to minimize the UV-value which subsequently diminishes the shading coefficient, resulting in improvement of overall energy efficiency of the building. Superior characteristics such as low surface emissivity, makes it ideal for usage in automotive windscreens as it absorbs and re-radiates very little light and heat. Technological advancements on usage of these products in automotive rear and side view mirror are being done, which should further surge product demand. Solar control glass market from construction projects may surpass USD 980 million by 2024. Increased product usage in non-residential buildings as it comprises of invisible layers of special materials which allows the sunlight to pass through it but lowers down the solar heat in the building. These products are double glazed, which means they are helpful in insulation also. Consumers tend to work and live in air-conditioned environments for comfort and productivity, which hence increases the energy demand. 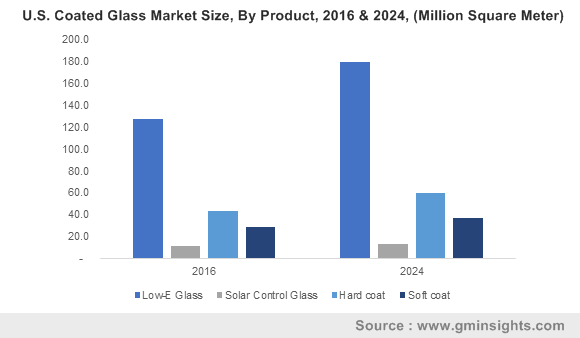 Increasing installation of solar panels along with minimization of the requirement of air-conditioning will drive coated glass market demand. Hard coat glass market size from automotive windshields will register growth close to 4.5% owing to good impact and abrasion resistance. These products do not break up into large pieces upon impact and thus minimizes the risk of injury to the consumers. Styling flexibility, impact resistance and light transmittance properties of the products add value to the OEMs. Technology development to enhance weathering and abrasion resistance of hard coats will further surge demand. Soft coat glass market size will exceed USD 2.5 billion at the end of 2024. These products are also known as off-line coated glass and are used in double glazed units. It provides same neutral appearance and thermal performance as that of its counterparts and can be used in replacement windows for existing homes and glazing applications in conservatories and new houses. Growing residential infrastructures in Europe owing to massive movements of migrants to the region have supported industry growth. Europe coated glass market size driven by France, Germany, Russia, Poland and UK will register steady growth at over 3.5%. 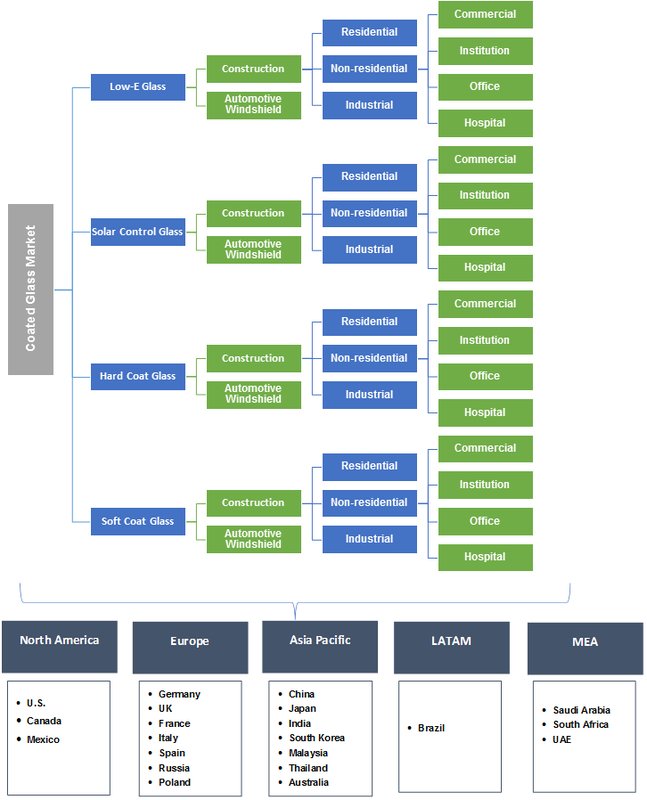 Growth in green buildings, hospitals, offices and institutions have enhanced the construction output in Europe. Rise in environmental concerns have led to implementation of various norms regarding carbon emissions and energy savings, which may further enhance product demand. Automotive manufactures use these products in the vehicles as they do not break up into sharp pieces on impact and presence of various automotive manufacturers in the region has favored industry growth. Brazil low-E glass demand from automotive windshield will surpass USD 55 million by 2024. Fiat Chrysler Automobiles, Honda, Toyota, Volkswagen and General Motors are opening or expanding their automotive production facilities in the region to boost up the local economy. Over 1.8 million passenger cars were produced in Brazil, which has stimulated product demand. Increased government initiatives and financial banking has offered opportunities for OEMs to expand up automotive manufacturing facilities, thereby stimulating industry growth. China coated glass market size may witness gains close to 7% during the projected timeframe. Rise in construction expenditure owing to change in consumer lifestyles along with government initiatives such as National New Type Urbanization Plan has enhanced construction for both residential and commercial buildings. Easy availability of labor and low production costs has propelled various industry manufacturers to set up production units, resulting into enhanced product demand in industrial buildings. Global coated glass market share is moderately consolidated with major industry participants include Guardian Industries, Saint-Gobain, PPG, Sisecam Group, Glaze-Tech Industries, Schott AG. Other manufacturing companies include, Euroglas, Abrisa Technologies, and Pilkington Group which cater products to local and international market. The companies are strengthening their regional presence and expanding their product portfolio by making strategic initiatives such as mergers, acquisitions and joint ventures. Coated glass is used to control the exposure of the surface to vapours, which binds the glass and plays a significant role in solar thermal and photovoltaic applications. Coatings enhances the transmission, reflection and absorption properties, and offers corrosive & scratch resistance. Increased usage in conserving energy in residential and commercial buildings have stimulated industry growth. Rising demand for clean source of energy owing to technology advancement has propelled growth of solar thermal electricity, resulting into increased product demand. Installation of solar thermal parks on a global scale along with wide usage of product in automotive windshield application will further boost industry growth.